What prevents companies from appointing more women directors? Gender diversity on boards continues to be a globally debated conversation. There is now a body of evidence that links diversity in companies to financial performance. From April 1, 2014, when the 2013 Companies Act (Section 149) became effective, organisations had a year’s time to comply with the law that makes it mandatory for listed companies to appoint at least one woman director. If a company failed to comply, a penalty of Rs. 50,000 extending to 5 lakhs was to be imposed. The effects of this regulatory push are evident. Indianexpress.com findings from its analysis of data collected and maintained by Prime Database for the boards of top 500 companies listed on the National Stock Exchange (NIFTY 500) has shown high compliance to the rule. Of the 500 companies, 357 (71 per cent) had one woman on their board. Twenty-six per cent of these companies went beyond the mandatory minimum requirement. There were 98 companies with two women on their boards and 31 with three or more women. 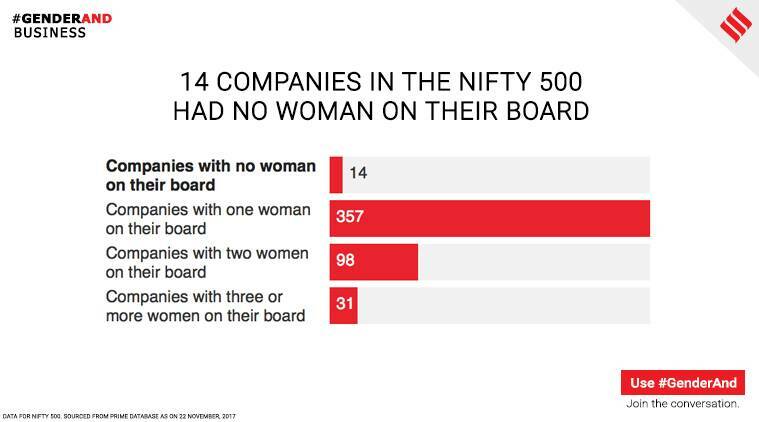 But 14 companies did not have a single female member on their board. In addition, there were five companies that had no women on their boards ever since the law mandated it. Not all of these companies are from the NIFTY 500 but a larger set of listed companies on the NSE. On the other hand, there were two companies that had five women on their boards. Indianexpress.com contacted companies on both ends of the spectrum. Of the 14 companies in our data set that did not have a single female member on their board, eight were PSUs. There are a total of 58 PSUs in the NIFTY 500, which means about 14 per cent of the PSU companies on the NIFTY 500 were non-compliant. For the private sector, that figure stood at about one per cent. This variance is not entirely new. PSUs have lagged behind their private sector counterparts in compliance, since the law came into force. In 2015, Indian Express reported how 50 per cent of the PSUs on the NSE were non compliant as compared to 9 per cent of private companies. PP Chaudhary, the Minister of State for Law and Justice and Corporate Office told Parliament that 54 NSE and 88 BSE companies (which included PSUs) had not appointed women directors as of September 30, 2017 and fines had been levied against them. Apart from the delay that may happen in case of PSUs applying to the government to fill vacancies, another aspect that companies sometimes use to explain non-compliance is SEBI’s Listing Obligations and Disclosure Requirements (LODR), 2016. 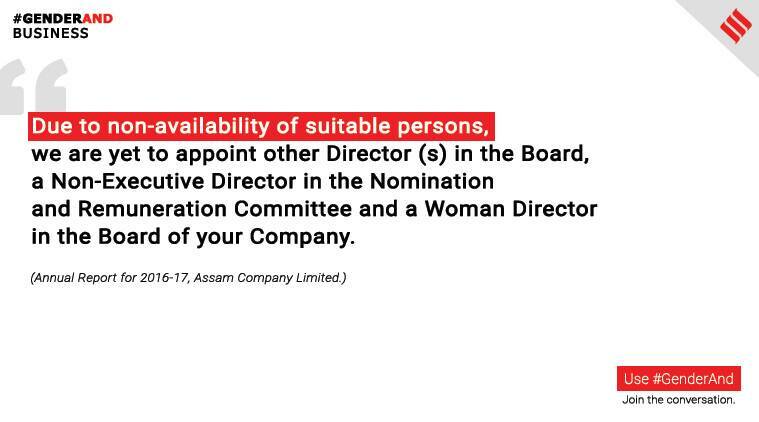 Under this, listed entities that have a paid up equity share capital up to 10 crores and net worth not exceeding 25 crores are not required to have one woman on the board. On the other side, companies like Godrej Agrovet Limited (GAVL) have gone beyond the mandatory requirement. From one woman director on board in 2007, GAVL has five women directors on its board, with Nisaba Godrej as Chairperson. The company has also increased the percentage of women in senior leadership (vice-president and above) from nine per cent in 2014 to 15 per cent today. “We do not mandate hiring women for any role, because we want to hire the best candidates based on merit. But, we do want our businesses to evaluate enough women candidates before they make their final decisions,” Nisaba Godrej told Indianexpress.com. 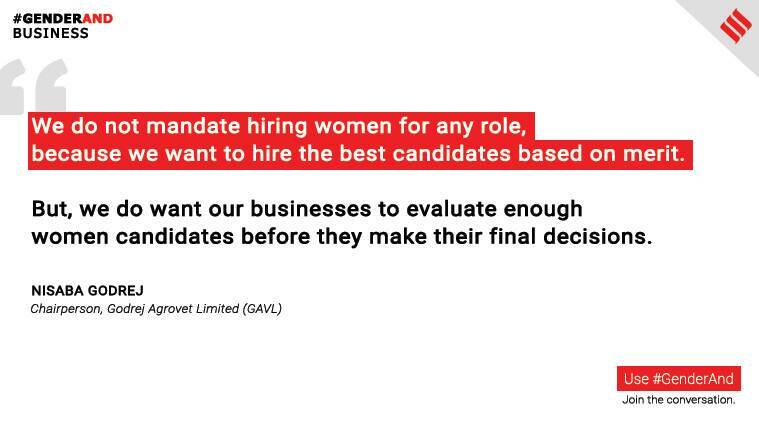 In 2016, GAVL made it mandatory to evaluate a certain percentage of women candidates for hiring at Levels 3 and 4 (General Manager and above). Depending on market availability, the company made it mandatory to evaluate at least 20 per cent women for functions like Sales and Operations and at least 50 per cent women for HR, Marketing and Strategy. There have also been companies who have had women directors on board before the law made the appointment mandatory. In the NSE listing, Airan Ltd. has had a woman director on their panel since 2003. The company made a conscious decision to induct four additional women directors in early 2017 post the 2013 law. At Airan, half of the Audit committee members, three of the four members of the Nomination and Remuneration Committee, and all members of the Stakeholders Relationships committee are women. The latter two are also chaired by a woman. It would be a tragic consequence if gender diversity was reduced to an exercise in mere compliance. As companies above have shown it requires a change in corporate mindset and setting up processes that allow equal opportunity.